Southern escarpment of the Palani Hills showing the island effect created by the sheer cliffs and mist over the plains. Taken the day after the completion of the symposium. On December 20th Kodaikanal International School (KIS) hosted a unique symposium of scientists, officials and concerned citizens on montane forest plantations in the Western Ghats and the regeneration of shola species in them. The conference was organized by Teri University and the Vattakanal Conservation Trust with KIS providing a space for the discussion. The focus of the conference was on the ubiquitous role of non-native tree plantations in the Western Ghats and what their role in biodiversity conservation is. In past years it was assumed that alien species plantations had a negative impact on overall biodiversity in the Western Ghats. However, new evidence gathered from a number of studies show that the picture is more complicated and that in many case plantations are facilitating a comeback of native shola flora and fauna in the Western Ghats. The December symposium followed up on a dialogue about shola/grasslands that has been going on amongst scientists, conservationists and other interested people over the last few years. In September a landmark meeting was held in Bangalore entitled “Ecological restoration in a changing world: Insights from a natural forest-grassland matrix in the Western Ghats” (Web link). The meeting at KIS was a follow up to the September meeting but with a specific focus on the role of plantations. In May 2014 a court order in Madurai had brought the issue of plantations into the limelight (see the Hindu article from May 13th) and there has been a clear need to examine the scientific evidence of plantations and their interplay with the shola/grasslands mosaic in the upper Western Ghats. Pine (Pinus sp.) plantation started in the early 1970s near Poombari village in the north-western Palani Hills with advanced natural regeneration of shola species. A key aspect of this is the presence of a nearby “mother shola” where seeds can be dispersed from. On Saturday morning Rudy Wuthrich, KIS’s technology director, welcomed participants on behalf of the school with a short speech aligning the themes of the conferences to global discussions on climate change that were recently concluded in Lima. Milind Bunyan of the Ashoka Trust for Research in Ecology and Environment (ATREE) gave a compelling overview of the shola/grasslands mosaic in the Western Ghats. In particular he highlighted the issue of bi-stability and factors (both natural and anthropogenic) that give rise to dominance of either the grasslands over the shola and vice versa. Prof. Albert Reif of Frieburg University focused on the theoretical background of ecosystem fluctuation, degradation, succession and restoration using examples from Venezuela, Chile and Germany. The talk helped give a global perspective to an issue that most of participants were only aware of at the local Western Ghats scale. This was followed up by professor Joachim Schmerbeck’ s talk entitled “regeneration of shola trees species under forest plantations in the Palani Hills.” Joachim, who was been the force behind the conference, has an old association with the Palani Hills and has been regularly bringing his students from Teri to conduct field work here (see the proceedings at the end of this post for examples of these studies). A major point that he made was the need for a clear, measurable aim to have as the Forest Department, citizens and NGOs go through the process of looking to engage in ecological restoration. One of the Teri students, Kunal Bharat, presented his findings that looked at socio-economic impacts of the plantations and their ecosystems services in the Palani Hills. Kunal’s study revealed fascinating numbers of fuel energy consumed in the villages of the Palani Hills-an important factor as discussions proceed on how best to utilize the plantations. One theme from the conference was the idea of “sky islands.” This is an idea that the high altitude areas of the Western Ghats are like virtual islands, isolated from neighboring ranges by lower altitude and plains areas where physical, biological and human issues are very different. It has led to a unique assemblage of biodiversity in each of these islands. The Palani Hills are part of an island block that include the Anaimalai Hills and High Range. They are separated from the large Nilgiri Hills plateau to the north by the Palghat Gap. To the south the Cumbum Valley separates the Palanis from the Highwayv mountains and Periyar Tiger Reserve. Robin Vijayan has popularized the idea of Sky Islands with his scientific study on the ecology and spatial distribution of the White Bellied Shortwing, a small bird species that is exclusively found in shola forests. It is an indicator species of sholas and has a distribution that reflects existents sholas all the way from the southernmost ranges of the Western Ghats to a little north of the Nilgiri Hills (see his website for a more detailed account of shortwings). Nisarg Prakash and Vijay Kumar of the Nature Conservation Foundation (NCF) shared a presentation on their efforts with wildlife conservation and restoration in the Anaimalais Tiger Reserve (ATR). NCF’s work with tea and coffee plantations are well documented as a successful case of a science-based approach to facilitate a practical conservation-oriented intervention in degraded landscapes. Their experience with removing wattle from montane grasslands in the Grasshills part of the ATR sparked discussion on using similar approaches in the Palanis. (Left) Tanya of the Vattakanal Conservation Trust sharing insights into shola regeneration in plantations. (Right) Jaykaran, Bob and Tanya at the open discussion. Finally Tanya Balcar of the VCT shared observations on the role that plantations in the Palani Hills have played as nurseries for shola species. There were two broad points to her presentation: plantations of non-native species when located near to intact sholas are playing a key role as nurseries of young shola species. In some cases, such as in Blackburn Shola, these shola species through a process of ecological succession are actually taking over and replacing the plantation species. Thus, to clear cut “alien” plantation species harms this process and generally leads to an infestation of alien weeds (lantana, eupatorium etc.). Secondly there are still vital montane grasslands located in key locations in the Palani Hills (Perumal and Ibex Peaks etc.). Intervention to weed out spreading alien species in these locations is worth the significant effort in order to protect the grasslands and marshes from being overwhelmed and replaced by the plantation species. Along with concluding comments and an open session facilitated by Teri’s Professor P.K.Joshi, the symposium was completed with a field visit to different forest and plantation patches on the road to Poombari. 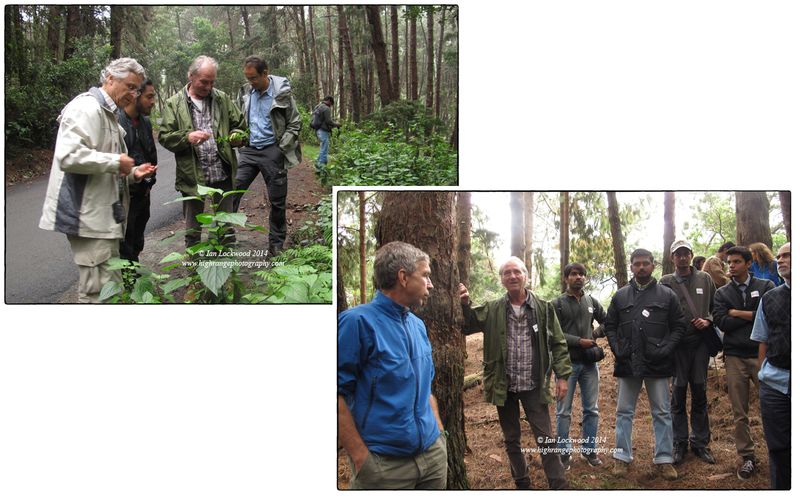 A visit to observe plantations and shola revival in them on the road from Kodai to Poombari. 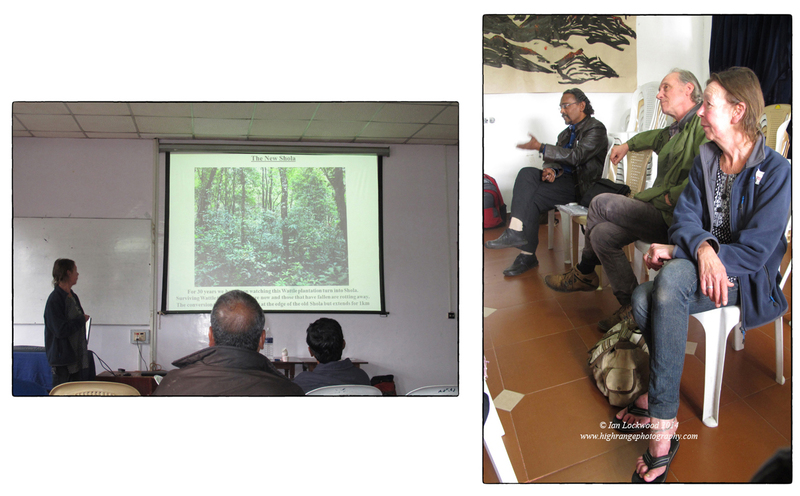 Though the meetings was relatively short, it provided an important platform to share ideas amongst individuals interested in ecological restoration in the southern Western Ghats. In the future it would be ideal to have more participation of the Tamil Nadu, Kerala and Karnataka Forest Departments since they are the key decision makers and actors in the process. KIS is positioned at an important location to facilitate the ongoing research and conversations about montane ecology. The Palani Hills, like other ranges in the Western Ghats, host significant biodiversity but have also been subjected to significant human interventions. The school has been a silent witness to these ecological changes and in more recent years students and faculty have participated in restoration and conservation awareness programs. It would be ideal for KIS to host future (perhaps, annual) gatherings of scientists, citizens and officials from the Forests Department(s) to better chart out how to approach the ecology of the Palanis and other ranges in the southern Western Ghats. Several other key figures participated in the conference including students and professors for Freiburg University and Teri. Dr. Clarence Maloney and his daughter Iti represented several generations of KIS students. Sunayana Choudhry a Kodai resident and the INTACH Convener highlighted the recent publication Kodaikanal: Vanishing Heritage of an Island in the Sky, which was just released. It includes chapters by Bob & Tanya, Pippa Mukerjee, Pradeep Chakravarthy as well as several of my landscape photos and species shots. Prahbakar of the India Biodiversity Portal was at the symposium and I enjoyed brief discussions with him about land cover and vegetation mapping in the Western Ghats. Robin Vijayan, a key leader in the shola/grasslands, group was unfortunately held back by a vehicle breakdown. Prasenjeet Yadav, who is the recipient of a National Geographic Young Explorers grant to document sky islands came along and we were able to spend time walking and sharing notes in Bombay Shola on the following day. Special thanks to Beulah Kolhatkar for providing logistical support and helping to get the conference off the ground at KIS. In conclusion it was a significant success and as a member of the Kodai family interested in biodiversity conservation as well as issues surrounding the shola/grasslands mosaic, I hope that we can host future gatherings to better protect our ecological heritage. Bunyan, Milind Sougata Bardhan and Shibu Jose. “The Shola (Tropical Montane Forest)-Grassland Ecosystem Mosaic of Peninsular India: A Review.” American Journal of Plant Sciences. 2012. 3. Web. Fleischman, Forrest D. “Why do Foresters Plant Trees? Testing Theories of Bureaucratic Decision-Making in Central India.” World Development. 62 2014. Web. Lockwood, Ian. “Breathing Life Back into the Sholas.” Frontline. 20 April 2012. Print & PDF. ” “Ecological Restoration in the Palani Hills.” Ian Lockwood Blog. April 2012. Web. ” “Land Cover Changes in the Palani Hills: A Preliminary Assessment.” Ian Lockwood Blog. April 2014. Web. ” “The Next Big Thing.” Sanctuary Asia. June 2006. Print & PDF. Mohandass, D et al. “Influence of disturbance regime on liana species composition, density and basal area in the tropical montane evergreen forests (sholas) of the Western Ghats, India.” Tropical Ecology. 56(2) 2015. Print & Web. Naudiyal, Niyati and Joachim Schmerbeck. Land Use Related Biodiversity in India: Seminar Proceedings 2013. New Delhi: Teri University, 2014. Print and Web. Satish, K.V. et al. “Geospatial assessment and monitoring of historical forest cover changes (1920–2012) in Nilgiri Biosphere Reserve,Western Ghats, India.” Environ Monitor Assessment. February 2014. Srnivasan, Madhusudan P. et al. “Vegetation-environment relationships in a South Asian tropical montane grassland ecosystem: restoration implications.” Tropical Ecology. 56 (2). 2015. Print and Web. Thomas, S.M. and M.W. Palmer. “The montane grasslands of the Western Ghats, India:Community ecology and conservation.” Community Ecology. 8 (1) 2007. Print & Web. van Andel, Jelte and James Aronson ed. Restoration Ecology: The New Frontier, Second Edition. U.K: Blackwell Publishing Ltd., 2013. Print.